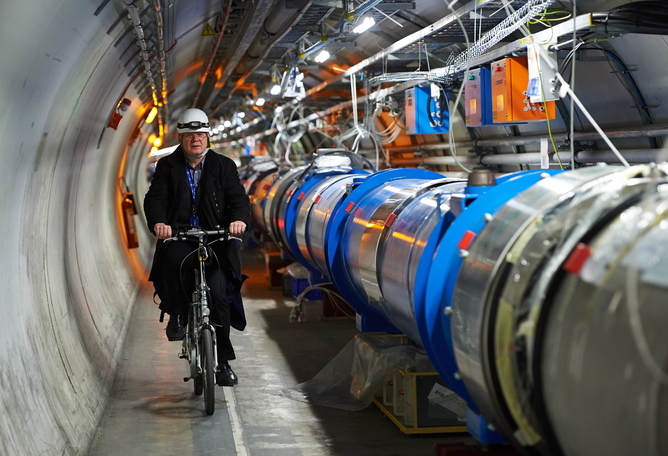 A Polish scientist uses his bike to get around the vast Hadron collider underneath the Swiss alps. Do you, too, use your bike to get around at work? We know CoGG has a fleet of bikes for staff use, and that workers at Shell used to get around the refinery by bike. The circular collider is so vast, the the tunnel hardly seems to curve at all. The collider is 17 km in circumference and around 175 metres below France and Switzerland. The header image is a simulation of the Higgs boson (God) particle experiment. This entry was posted in Bicycle commuting, City of Greater Geelong Council and tagged Hadron Collider by hlyth2013. Bookmark the permalink. Well the one thing the Hadron collider proved to all the predictors of doom – the sky didn’t fall when they flicked the switch. The downside is they are yet to find the God particle. Also I will take the opportunity to congratulate Rod Charles on the release of his new book. After seeing some image I realised I worked at the same establishments as Rod and Peter Smith – Geelong is such a small place.